As you may have noticed, a 12 inch vinyl picture disc version of ‘On Divine Winds’ was released earlier this month through Metal Blade Records, It’s already sold out via the official Metal Blade/EMP webshop but we have managed to capture some of the last copies. Please get in touch with us via our facebook page: www.facebook.com/hailofbulletsofficial if you’re interested in ordering one of the very last copies. No release date has been planned for a picture disc edition of the first album yet, but we’re working on that. Meanwhile we have been busy writing new songs for our upcoming third full length album. The songs are finally taking shape now and we hope to conclude the writing process around the end of 2012, so we can start recording early next year. We expect the album to be released sometime in 2013. First of all we’d like to wish you all a great new year and we’d like to thank everyone for making 2011 such a great and very succesfull year for the Bullets! We had a blast at festivals like Hellfest, Wacken, Summer Breeze, Party.San, Brutal Assault and Way of Darkness and the same goes for most of the awesome club shows we played – THANK YOU!!! In 2012 we will start writing new songs for our upcoming third album, but of course we will also stay active on the live front! Stay loyal, stay brutal, stay sick! The HAIL OF BULLETS show at Het Front -Vroomshoop (NL) planned for November 26th has been cancelled due to circumstances beyond our control. People who already pre-ordered tickets will get their money back from Het Front. Message for all our fans in the northern region of Holland; please note that HOB will be playing the Dokkum Open Air fest June 30th, 2012, so see you all there! Please check webstore/ merchandise page for special offers on several items!! HAIL OF BULLETS officially enter German album charts! HAIL OF BULLETS officially enter German album charts on position 75! Dutch Death Metal Masters HAIL OF BULLETS have entered the official German album charts on position 75! A great success for the band and a great success for old school Death Metal in general! HAIL OF BULLETS exclusive video premiere for ‘Operation Z’ on MySpace! Dutch Death Metal Masters HAIL OF BULLETS will premiere the video clip for ‘Operation Z’ – the first single off their second full-length ‘On Divine Winds’ – today exclusively on MySpace! Surf over to the MySpace site of HAIL OF BULLETS http://www.myspace.com/hailoffuckenbullets to check out the video! Make also sure to surf over to http://www.metalblade.com/hailofbullets/ to check out more music, videos, the Karaoke contest and the various bundles available for ‘On Divine Winds’! Rock Hard Germany, 9,5/10 points, album of the month! 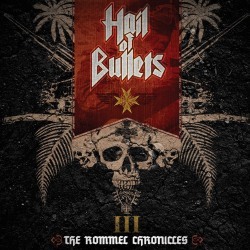 HAIL OF BULLETS issues lyrical and musical descriptions on each song exclusively via website of German Metal Hammer! German and English version available! Dutch Death Metal Masters HAIL OF BULLETS release their second full-length ‘On Divine Winds’ today in Europe and tomorrow, Tuesday, in North America! To celebrate this week of release the band has issued detailed descriptions on lyrics and music on each song off the new album! Surf over to the website of German Metal Hammer to find out more about the content of ‘On Divine Winds’! HAIL OF BULLETS launch full album stream of upcoming album ON DIVINE WINDS exclusively on Metal Underground.com! AGOURA HILLS, Calif. – October 04, 2010 – In conjunction with the upcoming second full-length release from HAIL OF BULLETS, ON DIVINE WINDS, Metal Blade Records has teamed up with MetalUnderground.com to premier the old school death metal act’s album ON DIVINE WINDS in its entirety. Be sure to head over to MetalUnderground.com, a metal site that provides fans with comprehensive metal news coverage, reviews, interviews, band info, live concert reports, photos, and is updated daily by a dedicated staff of die-hard metalheads, to check out HAIL OF BULLETS’ upcoming album ON DIVINE WINDS while you can. The stream ends Monday, October 11th. If you like what you hear and see head over to the band’s landing page and pre-order the album while there is still time to take advantage of the discounted prices. ON DIVINE WINDS is available by itself or bundled with a t-shirt. ON DIVINE WINDS was produced by Ed Warby and like before the monstrous mix was in the capable hands of Mr Dan Swanö. HAIL OF BULLETS was formed at the end of 2006 when guitarist Stephan Gebédi approached singer Martin van Drunen, drummer Ed Warby, bass player Theo van Eekelen and guitarist Paul Baayens with the idea to join forces in an old school death metal band. The band members already knew each other from their previous and present bands including: Asphyx, Gorefest, Thanatos and Houwitser. A serious drinking and thinking session followed and the plans for the band’s musical direction were laid down that night. From the start it was crystal clear there was a mutual love for true death metal bands like Autopsy, Massacre, Bolt Thrower, early Death as well as Celtic Frost. The metal started flowing and within a couple of months they already had enough material written for a full length album. In July 2007, the band decided to record four songs for a demo CD. Swedish death metal guru Dan Swanö produced the four songs at his Unisound Studios and the result turned out pretty monstrous. Metal Blade Records didn’t hesitate to sign the band and HAIL OF BULLETS’ debut album …Of Frost And War was released in May 2008. Apart from the thundering drums, scorching guitars and tormented vocals, the lyrical concept about the battles at the Eastern front during World War II made the album’s impact even greater. The reactions of press and fans were amazing and the band played countless festival dates and club shows all over Europe. The debut album was followed by a six-track mini album in July 2009, entitled Warsaw Rising, which featured two brand new songs, a cover version of Twisted Sister’s ‘Destroyer’ plus three live tracks recorded at 2008’s Party.San Open Air festival. More shows followed and the band even made their first visit to the USA at 2009’s Maryland Deathfest. In the beginning of 2010, the band started work on their second full length album, another massive chunk of war-themed death metal. Singer/lyricist Martin van Drunen managed to come up with a new, intriguing concept; the rise and fall of the Japanese Empire. For the first time in history, a new art of warfare where all modern day forces: Navy, Air force and Army were combined in joint operations. Mick Koopmandcraft the striking artwork, which shows a distinct continuation of the HAIL OF BULLETS aesthetics. The album was produced by Ed Warby and like before, the monstrous mix was in the capable hands of Mr. Swanö. HAIL OF BULLETS go on a full scale war with ON DIVINE WINDS! HAIL OF BULLETS announce Karaoke Contest! Win a gig performance with the band! Dutch Death Metal Masters HAIL OF BULLETS have announced a Karaoke Contest. You always wanted to perform with one of the hottest Death Metal bands around these days? You think you can beat vocal legend Martin van Drunen in a vocal contest? Here’s your chance! Download the instrumental version of “Operation Z” – the opening track off HAIL OF BULLETS new album “On Divine Winds” – stream the song with vocals – and upload a video of yourself singing the song. The first winner will get the chance to meet the band and sing “Operation Z” in the encore of a HAIL OF BULLETS set! There will be 10 prizes in total so don’t miss out here! HAIL OF BULLETS launch landing page for ‘On Divine Winds’ including new song, video from bonus-dvd and pre-order deals! Bonus-dvd details revealed! Dutch Death Metal Masters HAIL OF BULLETS have launched a landing page for their upcoming new album ‘On Divine Winds’! Surf over to http://www.metalblade.com/hailofbullets/ to check out the new song Operation Z, a live video of Nachthexen (taken from the first album …Of Frost And War) and the pre-order deals available Worldwide. In Europe you can decide between the regular cd, the limited edition Digibook including bonus track and bonus-dvd, a bundle including the Digibook and a brand new T-Shirt and the limited 2-Gatefold-LP! The limited edition Digibook includes a full live-DVD. The DVD was recorded with multiple cameras at Summer Breeze festival 2008 and includes the whole 45-minute set! The dvd will feature an additional two video clips. ‘On Divine Winds’ features 12 tracks on the limited first Digibook edtion and 11 tracks on the regular jewelcase version. The album will be released October 8/11 via Metal Blade Records in Europe!